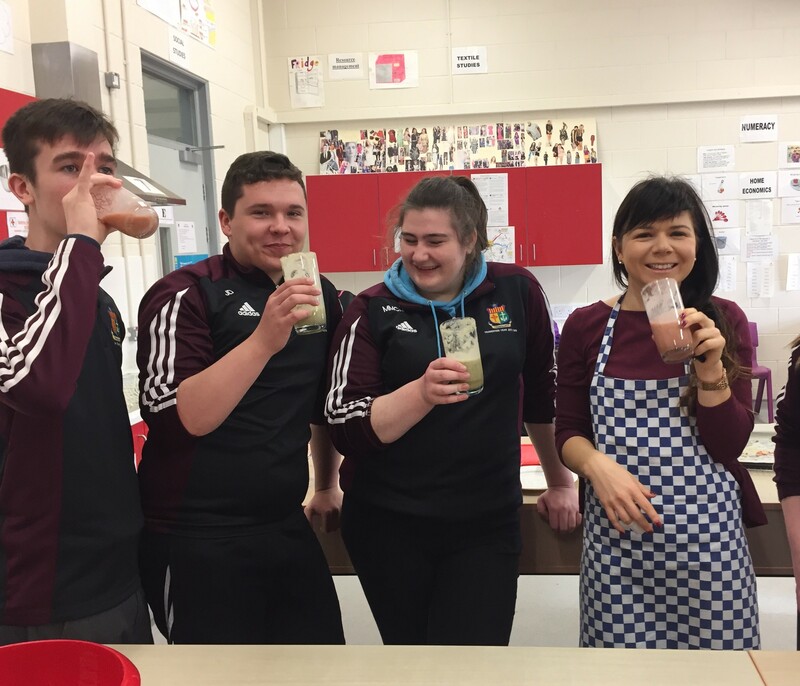 Following on from the development of the Recipes and the huge success of our ‘COOK OFF’, our 14 students worked closely with Ms. o Donnell, our Home Economics Teacher to develop and research the recipes. As part of this research method the students analysed the nutritional content of all of the dishes they had prepared. Measure out the flour in a large bowl and add the buttermilk. Then add in kelp powder and cherries then mix it together. Then cut up the almonds. Cut out the dough using cookie cutters to form the shape of a scone, make the dough thick enough as they don’t rise that much when in the oven. Put the mixture on the tray and place tray in the oven. Let bake for about 15 minutes while continuously checking to see that they’re not burning. You then take out when golden brown. Appearance/Colour Golden brown with parts of red due to cherries. 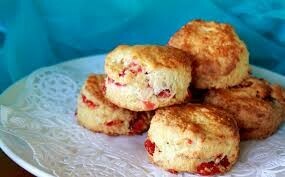 I could not see the seaweed as it was not noticeable in the texture of the scone. Taste/Flavour A sensational taste that you would usually get off baked goods. You could get a small taste of seaweed abit salty but it wasn’t very noticeable it mostly added flavour. Texture Crispy on the outside fresh and soft on the inside. 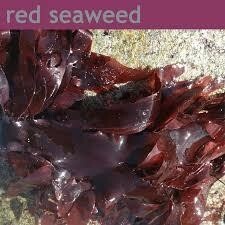 Seaweed was not noticeable in the texture as it was dried kelp that was used. Allergy Information: Contains nuts, buttermilk, butter and cherries. Method: We cut up 5 strawberries, 5 bananas and we poured the fruit and the water into the blender. We poured the sea lettuce on top of the fruit and then we poured the honey on top of the sea lettuce and we let the fruit blend for 90 seconds. Texture: The smoothie was smooth and chunky. Strawberries Bananas and Kiwis are all rich in Vitamin A & C and strawberries are also high in Sugar and Bananas are high in Potassium. Vitamin A– The main function of vitamin A is to support vision and it plays important roles in the development of bones. In addition, Vitamin A provides a barrier against infections. Sea lettuce has 1.25g of carbohydrates which is the main source of energy in our body. Beat the white until stiff and fluffy. Add this to the milk too. Leave the pudding in the fridge until cold and set. Protein: it has 15g of protein which is a high amount. Carbohydrates: it has 46g which is very high amount. Fat: it has 1.4g of fat. Protein: It has 3.4g of protein which is quite low. Carbohydrates: It has 5g of carbs which is low. Fat: it has 1g of fat. Vitamins: It has vitamins A, C, D and calcium. Protein: it has 13g of protein which is an average amount. Carbohydrates: it has 1.1g of carbs. Fat: it has 11g of fat. The burgers where dark brown and looked well done on the outside and on the inside they were slightly pink and looked not overcooked. The appearance of the end result looked very appetising. The burgers were very flavourful with hints of the garlic and seaweed. The seaweed gave the burger a nice peppery taste without it being too overpowering. The texture of the burger was tender. High in protein (high biological value) for growth and repair. It is also high in saturated fat which is needed for energy but should be eaten in moderation as it can cause high cholesterol. It also contains B group vitamins for a healthy nervous system. It also has an excellent source of iron for haemoglobin production. Dilisk has a decent amount of protein which is needed for growth and repair. Dilisk is also high in carbohydrates which are needed for energy. It is also low in fat which is very useful for low calorie diets. Dilisk is a very good source of B group vitamins especially B12 which is usually found in animal foods. This would be a valuable source for vegetarians. B12 is essential for red blood cell formation. It contains a variety of minerals such as calcium for healthy bones and teeth, iodine for a healthy thyroid gland. It also contains significant amounts of magnesium, sodium and zinc. Kelp is high in sodium which is essential for water balance in the body but too much can cause high blood pressure. Kelp also contains fibre for a healthy digestive system. It also contains protein (moderate amount) for growth and repair of cells. It is low fat but the saturated fat is the highest. It contains a variety of vitamins and minerals including vitamin A, vitamin C, vitamin D, vitamin B12, vitamin B6, calcium, iron and magnesium. The burger looked well done with a golden colour on the outside and greyish colour on the inside with a hint black from the dilisk and yellow from the chickpea. The bread rolls also looked golden brown because it was toasted. The burger was very nice, it tasted a bit salty from the dilisk and a strong taste of cheese from the two types of cheeses. The burger has many different textures. The bread rolls were hard because of they were toasted. The burger was soft when you bit into it. Dilisk is very high in protein (12-21%) and low in carbohydrates. Chick Peas contain 19 grams of protein. They are high in carbohydrates and have a fair amount of fat. Cheese contains Vitamins D and A and is high in protein, cholesterol and carbohydrates. The quiche looked well done and was a golden brown colour. The dilisk was a dark purple and made the dish look more interesting. The quiche tasted good. The dilisk added a saltiness to the dish and complimented the cheese and leeks. The quiche had a combination of lots of different textures. This made it diverse and added variety. The pastry was flaky while the filling was smooth and soft. The dilisk was almost melt in the mouth.